One of the myths we talk about in “8 steps to innovation” is a belief that innovation begins with creativity. We observed in our research that most innovations begin with curiosity. This was true for James Watt, Gandhi and Mark Zuckerberg and for many other innovators. Hence we propose that building a challenge-book – a place where we list the problems we are curious about – is a good beginning. Challenge-book is the second step in our 8-step approach. What kind of challenge-book did we as authors build whose response was the approach “8 steps to innovation”? That is what I would like to present in this article. What are the sources of curiosity? We found 3 that cover majority of the challenges we came across. Those are: Feel the pain, Sense the wave and See the waste. Let’s see what kind of pains, waves and waste we came across that went into building our challenge book. Feel the pain: My co-author Prof. Rishikesha Krishnan published his previous book “From Jugaad to systematic innovation: The challenge for India” in February 2010. The response from corporate India was – “This is all fine. Tell us how we can go from jugaad to systematic innovation.” Essentially, the managers were saying that they don’t know how to run innovation initiatives effectively in their organizations. They were also saying, “Don’t tell us to be like Steve Jobs or Ratan Tata. We know we can’t. Or don’t tell us to give 20% time free to employees like Google to do whatever they can. Our business model doesn’t permit it.” This became one of the key challenges for us to explore and address. The second pain area of managers in India is presented succinctly by Baba Kalyani, Chairman Bharat Forge, when he said, “We are slaves in manufacturing; we have to be our own masters”. This has been a growing aspiration among managers in India to go beyond operational excellence and contribute in the innovation journey of their organization. Sense the wave: We, as authors, began to surf two distinct waves. 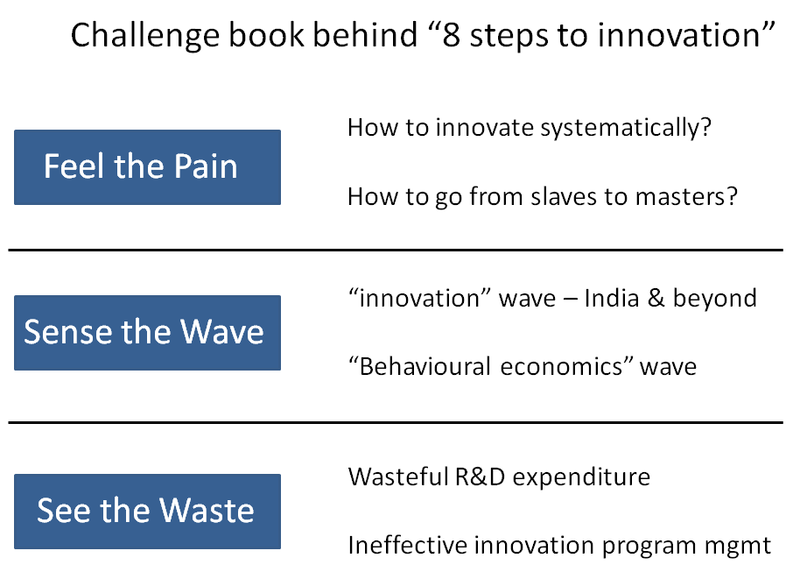 The first wave was related to the growing buzz around “innovation” everywhere but especially in India. We attended the first Innovation Summit conference held in Bangalore in 2005. President of India declared 2010-20 as the decade of innovation and formed National Innovation Council headed by Mr. Sam Pitroda. Tata Group, India’s laregest conglomerate, formed a group-wide forum called Tata Group Innovation Forum to foster a culture of innovation. Clearly more people in India started talking about innovation than ever before. The second wave was that of behavioural economics that is shaking up the Rational-Agent model held closely by economists for the past few centuries. Daniel Kahneman getting Nobel in 2002 and then Malcolm Gladwell’s bestseller Blink creating debate around intuition helped. Right from Greenspan to Michael Porter began to admit that lack of frameworks for thinking rationally hasn’t been the key challenge for poor decision making. Kahneman and others were showing that the cognitive biases hardwired into our brain are the root cause. It was interesting to ask the question: What does all this mean for innovation management? Can the new understanding help manage innovation more effectively? See the waste: First decade of this century saw explosive growth of mobile phones and wireless networks. And yet it also saw demise of large telecom companies like Siemens, Nokia, Motorola, Alcatel, Nortel etc. Most of these companies were spending huge money into research – considered by many to be the main ingredient for innovation. Is it possible that these companies were spending the money inefficiently? Perhaps there is a much better way to do innovation? Another wasteful activity was related to ineffective innovation program management. One of the innovation program manager narrated to us how idea flow shot up right after the program launch. However, over the subsequent months the idea flow came down and finally became a trickle until everybody lost interest. The other waste is of India's creative potential.